"We're over managed, and under led!" 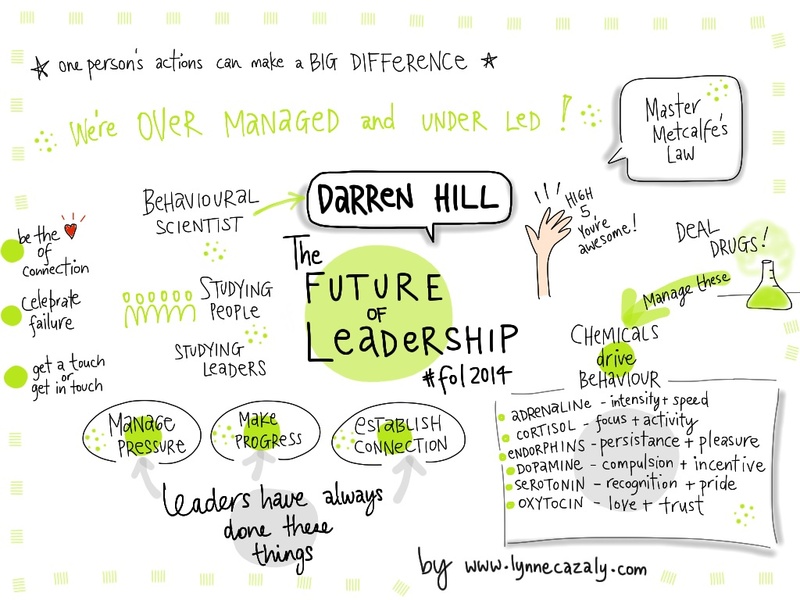 Darren's a behavioural scientist and he's been studying people - and specifically leaders - for a few years now. My visual notes from the session captured his key points. In today's workplaces, leaders need to 'deal drugs'. No, not illicit drugs, but the human chemicals that drive our behaviour! As Darren talked about adrenaline, cortisol, endorphins, dopamine, serotonin and oxytocin, it became clear that leaders indeed need to lead, to manage the pressure that change brings and to ensure the team makes progress. Leaders need to be the heart of connection in the team, to help celebrate failure and to understand these powerful human chemicals and how they impact team performance, behaviour and success. Are you leading... or still occupying yourself with managing things? 'One person can make a B - I - G difference,' he said. The Future of Leadership event heads to Brisbane, Australia on October 14. Get tickets here because 100% of the ticket sales go to Hands Across the Water. Now that's leadership!